These hexagonal garden parasols look great, and come in a range of colours to suit any outdoor setting. Featuring vented canopies and a unique tilting mechanism, these hexagonal parasols can be cleverly angled to follow the sun providing the perfect shade all summer long. Choose from our range of garden furniture umbrellas here. 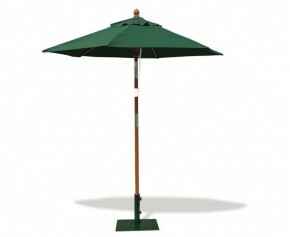 This 2m tilting garden parasol is from a ‘non-spec’ batch and is therefore not in tip-top condition. The pulley has some corrosion on it and may have slightly stained the canopy and cover. This will not affect the structural integrity of the parasol. This hexagonal 2m tilting garden parasol is available in a range of vibrant colours to add style to your outdoor setting as well as provide welcome shade.